Save Money By Saving Your Old Doors! The customer purchased these doors from Demolition Depot in Manhattan. We picked them up, stripped them, glued the loose joints with marine epoxy and filled the holes with fibreglass. Concurrently, we removed the modern door and trim and framed out the doorway, building exterior panels to match the period woodwork on the neighboring houses. We also closed up the interior surround, framing it and finishing it off with casement representitive of the period. The gap below the panels and doors awaits masons who will level off the step and place a saddle. More doors from Demolition Depot. We sanded the old finish off of them and stained them, top coating them with an exterior urethane. We also had to reglue the joints using a marine epoxy. We stripped and refinished the surround. The next phase of this project will be to finish the entire vestibule with period panels on the walls, to replace what had been removed by previous owners, and to case out the inside of the doors with trim reminiscent of the period. Custom, two inch thick, raised panel door made by us out of quarter sawn red oak. 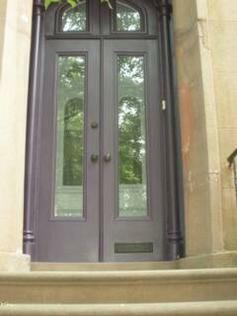 Made to match existing period doors in this Park Slope brownstone. Lock and hinges by Emtek. All installed by us. Ash screen doors made by us for a Manhattan townhome. The rift white oak casement molding surrounding the door frame was recreated to historic specifications by a local mill. These are four 105" tall custom doors made by us and hung on by-pass tracks. They are made out of poplar with simple stiles and rails. The recessed panels and glass is held in with trim not unlike the period trim used throughout the house. Mo​st homeowners contact us as a last resort before disposing of their original wood entry doors which they thought were too far decayed to be salvaged. Naturally, they are very pleased to learn that we can perform miracles on their old doors for a lot less money than the cost of new doors (about 1/2 the price; a little more in some instances, a little less in others). 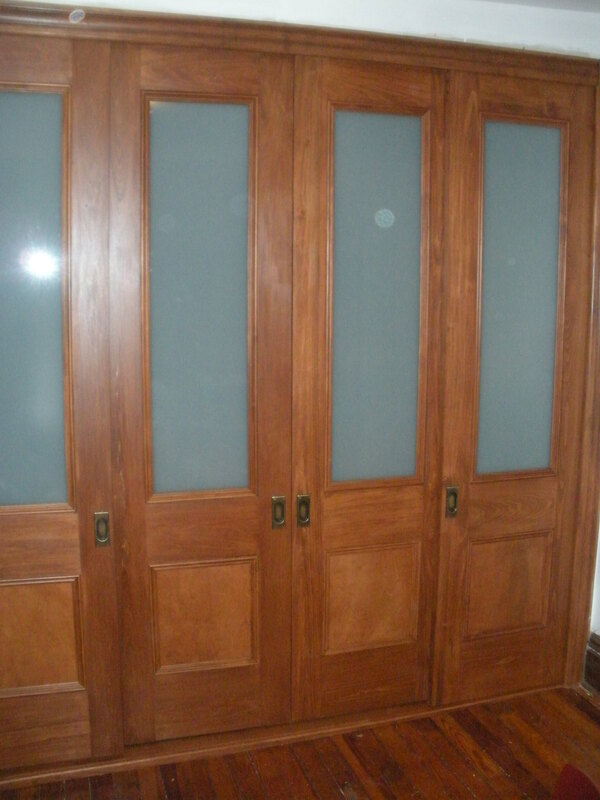 There is really no reason to replace your historic doors with modern and expensive reproductions. We can rebuild your doors using genuine wood and top quality adhesives and finishes and old world craftsmanship. A few examples of our work can be seen below. If you call us, we can give you some addresses of doors we have done so you may take a look at our work first hand. This pair of Borum Hill doors had been held together by molding screwed to the face of the doors. We removed the molding and found that about 2' of wood on the lock side of the left door was rotten and broken through. We cut that wood out and replaced it with new wood, two pieces of pine laminated together and spliced in place. All of the joints on these were open and loose so we reset those with maritime epoxy. The customers are most pleased. 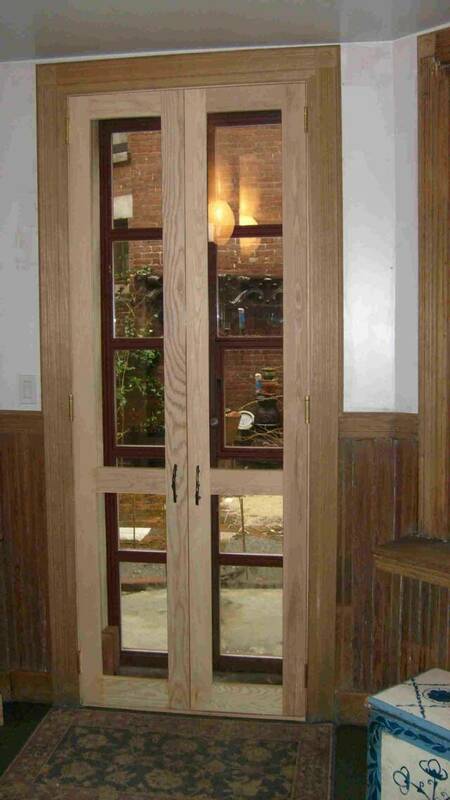 This picture of these Fort Greene doors was taken in May of 2013 - yet we rebuilt these doors early summer, 2011. They were pretty bad when we removed them - and we had to break them apart to work on them. We replaced some of the veneer (some patches are visible) and we replaced the molding around the glass. I cannot recall if we stained them or not but I do recall that we used a water based exterior varnish (General Finishes) - which is a departure for us as we prefer true oil base marine spar varnish. But after looking at the door two years on, the finish is as fine as the day we applied it. In addition to serving the 5 boros of NYC, we provide door restoration and repair services to Nassau and Westchester Counties. Feel free to email pictures of your doors to wooddoors@thetinkerswagon.com for an over the phone estimate. sourcing and installation of all needed hardware and locksets. rehanging. We also accept doors for pickup and hanging by the customer. apply insulated wood door stop around your doors for weather proofing. reface your existing doors with solid wood of your choosing, such as mahogany or oak. Please see Refacing Wood Doors. 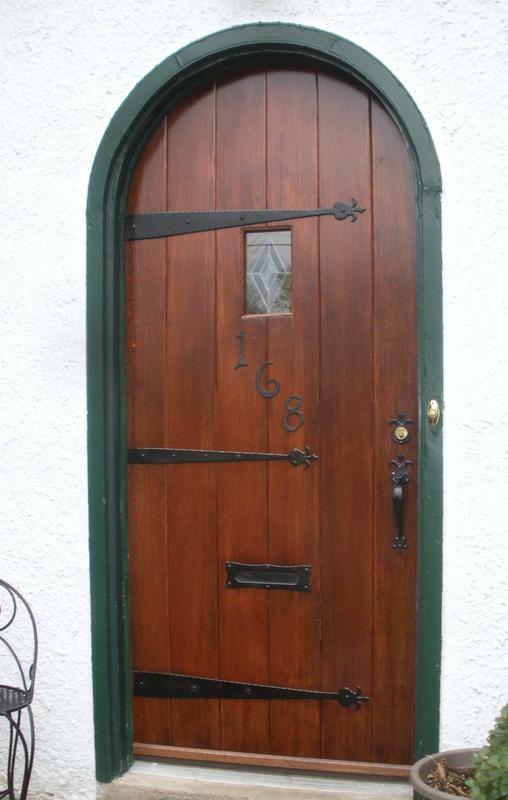 A proper door restoration, using traditional methods to remove rotten or damaged wood and splice in new wood in the same manner as the original assembly, takes skill and patience. Yes, you can find someone who will use modern epoxy wood fillers on your doors; they will get the job done faster and for less money. But will it last? We use only the finest products and traditional methods; our only advancements being the adhesives we use to bond the wood.